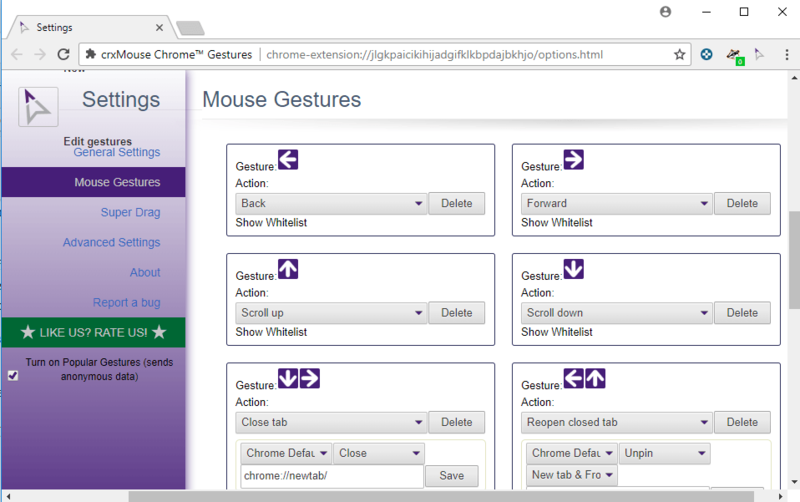 crxMouse Chrome Gestures is a free extension for the Chrome Web browser that adds mouse gesture controls to the browser. The extension is not the first add-on to add mouse gestures to Chrome but it is probably the most popular one. Chrome does not support mouse gestures natively but when Google integrated extensions support in the browser, extensions did add the functionality to the browser. Update 2: A report on Adguard suggests that crxMouse is used to collect data from users who install it. We decided to remove the link to the extension as a consequence and suggest you use Clean crxMouse Gestures instead. The main appeal of mouse gestures is that users may perform certain actions by drawing on the screen with the mouse. The extension adds numerous mouse gestures to Chrome by default including gestures to navigate back and forward, scroll, close tabs, or reload a page. While you can perform some of them using the mouse or keyboard as well, gestures add an option to Chrome to control Chrome from anywhere using just the mouse. The Chrome extension works right after installation. While you can get started using it right away, you may want to check out the settings at least once as there is a ton to customize and explore. Tip: you may want to disable the collecting of anonymous usage data in the settings. The main method of drawing gestures is to right-click and start to move the mouse to draw on the screen. The drawing, e.g. a line down or up, determines which action is executed when you release the right mouse button. Up and down would scroll up or scroll down, for example. The settings are divided into several sections. General settings is a good start as it defines the features and other core parameters such as the minimum length of the drawing. The mouse gestures section displays all active gestures and appearance related preferences. You can edit any gesture, for instance by changing its gesture, and create new gestures as well. If you prefer to use a different modifier for gestures, that is done here as well. You can switch from using the right-click to left- or middle-click modifiers, and assign a key to disable mouse gestures. The extension comes with a blacklist feature to block functionality on certain sites. As far as creating new mouse gestures is concerned: it is a two step process. You draw the mouse gesture on the screen in the first and select the desired action in the second. Note that gestures are limited to left, right, up, and down. While you can draw a circle on the screen, it is interpreted by the extension as left, down, right and up, or in whichever way you draw the circle on the screen. The Chrome gestures extension supports plenty of actions divided into navigation, scrolling, loading, tab navigation, window management, copy operations, and other actions. You can create mouse gestures to copy the URL of the active tab, stop the loading of all tabs, open a new incognito window, or any of the other actions provided. 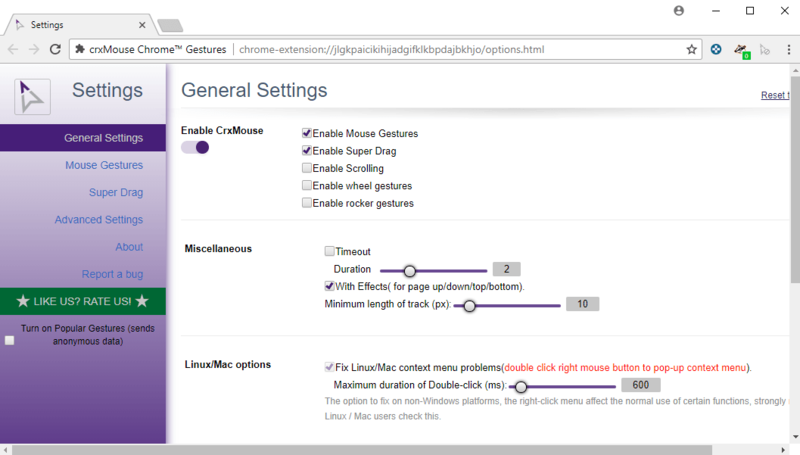 crxMouse Chrome Gestures supports what it calls Super Drag functionality besides regular mouse gestures. Super Drag lets you perform drag actions on text, link or images displayed on websites. Selecting text and dragging the selection to the left runs a search on Google or any other search engine you select. You can use Super Drag to search or copy text, open, copy or bookmark links, or open, copy, save or search images. Additional customization options are provided for some actions. If you select open, you get to define where and how the link or image is opened. crxMouse Chrome Gestures is a powerful browser extension for Google Chrome that adds mouse gesture and drag action support to the web browser. The gesture and drag actions worked fine and without issues during tests and they may speed up some actions, for example, the copying of the URL of the active tab or the downloading of images. Now You: Do you use mouse gestures in your browser of choice? If they want to appeal to the technical audience, which is the people who already use Opera and Firefox, they’re going to have to copy the mouse gestures. None of this “don’t sue us. we made up the mouse gestures on our own so no one would know how to use them” crap. Customizing the extension is extremely simple. The users have the power to create any action and pretty much any gesture they want. is there a way to change this mousegestures to my own gestures? go ahead, mess around. This extension is nothing new, but still amazing. Thanks, it helps. I got used to mouse gestures in Opera and FF, now forced to work with Chrome and missed them until this post. Ah, mouse gestures, one of these features I couldn’t live without. I’ve started using them relatively early thanks to Opera, which you had to pay for at that point to get rid of the ads. There’s a couple of alternative mouse gesture extensions available from the “Chrome Web Store,” though Smooth Gestures is the most popular one, and deservedly so. True. On Linux we only have properly working gestures on Opera, Vivaldi and Pale Moon. It was the thing I missed most in the “new” Firefox extensions system so I’m using PM now. I uninstalled Smooth Gestures since they made it paid and full of ads. I found a better alternative called crxMouse https://chrome.google.com/webstore/detail/crxmouse/jlgkpaicikihijadgifklkbpdajbkhjo/details This extension is free, push no ads and more reliable then Smooth Gestures. Didn’t crxMouse get remove from the Chrome Web Store because it was sending telemetry without user consent or notification? There even is a “clean” version of crxMouse. I do wish the “clean” fork of this was open source. We don’t know what it happening behind the scenes. Speaking of mouse gestures has the firefox port of this chrome extension improved? The developer releases updates regularly for the extension; some added new functionality, others fixed bug. I suggest you give it a try. smartup gestures is the other good one, perhaps better.